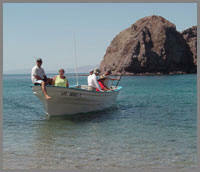 The Sea of Cortez is home to the Midriff Islands, which is considered to be a world class sport fishing location. 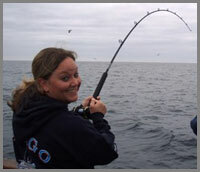 Because we fly you directly to this remote area, you’ll be able to spend less time traveling an more time fishing. 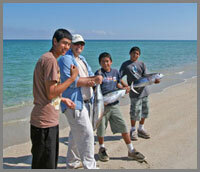 Many our guests who go out fishing with us have never thought about Baja fishing before. They found that the entire experience was so much more than catching fish, the incredible scenery and wildlife encounters make for a truly memorable experience. You can expect to see leopard group and spotted gulf, cabrilla, yellowtail, bay bass, halibut, corvina, white sea bass, barracuda, sierrr, skipjack, roosterfish, giant squid and dorado in the summertime. If your goal is to get the Midriff Island for its world renowned fishing in less time, without any other tourists around, then you’ll be happy that you chose to travel with us. You’ll get a chance to experience a Baja Fishing adventure that’s both exciting and has very small impact on the environment as a result of our selective catch and release process. Come fish with us and we will take you away from the crowds of Southern Baja, and allow you to experience what a Baja vacation is all about. 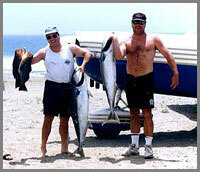 We offer weekly departures for our Baja Fishing trips, which leave from Brown Field, San Diego County, CA.